SIGN UP FOR JOHN BOROWSKI'S NEWSLETTER TO RECEIVE MONTHLY UPDATES ON SCREENINGS AND MORE! Details how the new Waterfront Productions Logo was created graphically and musically. John Borowski will lecture and screen Carl Panzram: The Spirit of Hatred and Vengeance. View the Workshop site to purchase tickets to attend writers workshops and more! John Borowski's entry in the ABC'S of Death 2 Competition for the letter "M". Days of the Dead Horror Convention hosts John Borowski and screens HH Holmes and Carl Panzram as part of it's 48 hour film festival. November 15-17 in Schaumberg, IL. Macabre Plays Nov. 15! Watch H.H. Holmes: America's First Serial Killer on WYCC PBS Chicago channel 20 on Oct. 26 at 8pm and Oct. 31 at 7:30pm. 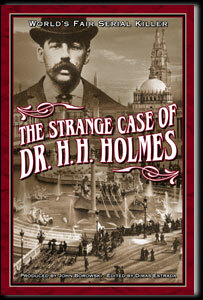 Please donate to the WYCC Pledge Drive and receive great perks such as the HH Holmes DVD and/or the Strange Case book. Waterfront Productions has a new HD motion logo! Music Composed by Joshua Moshier, Violin Solo by James Sanders, recorded at Studiomedia, Graphics logo by Panda Motion, Logo designed and produced by John Borowski. On August 9-11 meet John Borowski at the Flashback Horror Convention in Rosemont, IL. 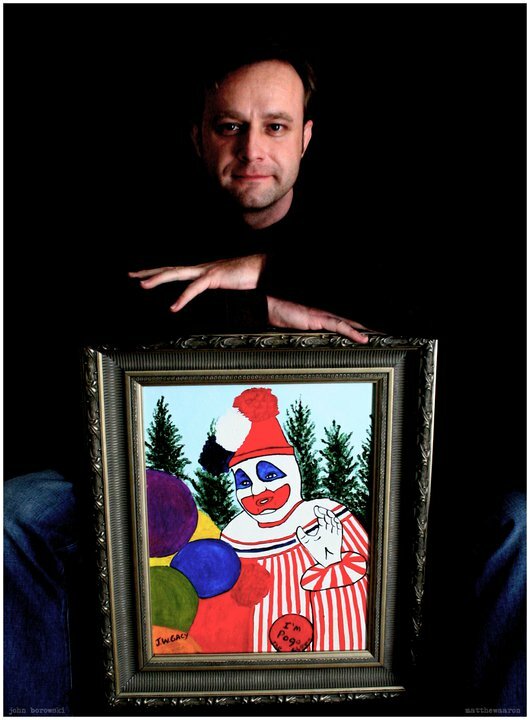 On August 17, Borowski appears at the All Night Flea Market in Wheaton, IL. Beginning at 4pm and ending at 4am, the flea market hosts many bands and special guests including Peter Mayhew who played the original Chewbacca! The Carl Panzram DVD can be purchased for educational and institutional sales through FILM IDEAS. Please let your local library, school or college know about Panzram! VIEW THE PANZRAM EDUCATIONAL SALES PAGE. Highest Rating- "Couldn't Be Better." "DiMaggio's voice is filled with hatred and snarling, quiet fury. Highly Recommended." Check out the May Issue #201 of Bizarre Magazine U.K. for a four page article on Borowski. The magazine hits U.S. Newsstands mid May. VIEW A PDF of the article. Collector Rick Staton, Author Stephen Giannangelo, Swedish rock band Sparzanza, U.K. artist Samhane, Hart Fisher, and David Van Gough have been interviewed for Borowski's next film, Serial Killer Culture. The film is slated for a summer 2013 release. Collector Rick Staton, Author Stephen Giannangelo, and Swedish rock band Sparzanza have been interviewed for Borowski's next documentary Serial Killer Culture. Interviews with John Borowski featured in April's Bizarre Magazine and Serial Killer Magazine Issue #11. 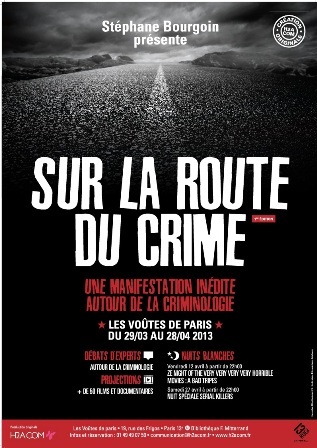 SCREENING IN PARIS, FRANCE - Borowski's American Killer Trilogy screening at Sur la route du crime on April 16, 2013. Interview with Borowski in Psychology Today. Special thanks to Katherine Ramsland. ORDER THE DVD NOW AT THE FILM WEBSITE. Only the first 1000 DVD's printed include a collector's card autographed and numbered by filmmaker John Borowski. Highlights from the August 12 world premiere screening of Carl Panzram. The Portage Theater in Chicago will screen H.H. Holmes on October 23 at 7:00pm. Filmmaker John Borowski and Holmes' great, great grandson Jeff Mudgett will be present for Q&A. On October 28 and 31 at 7:00pm, watch HH Holmes on Chicago PBS Channel 20. John Borowski will be hosting the pledge drive during the show. VIEW PHOTOS from the Crime Scene 2 event in Indianapolis, Indiana from August 12. Those who appeared were: Matthew Aaron & Endiana, The Murder Junkies, Joe Hiles from skcentral.com, The World Famous Crawlspace Brothers, John Borowski, and Jeff Gaither. April 26, 7pm and April 28 and 8pm. Northern Star Newspaper Article on Holmes Screening in Dekalb, IL. FIlming the Dahmer Tours for the Serial Killer Culture Documentary. Meet Filmmaker John Borowski Saturday, March 24. The fest runs 3/23 thru 3/25/12. Meet Filmmaker John Borowski in Rockford (March 31) and DeKalb (April 1) Illinois. Borowski will be interviewed on Dirty Laundry Podcast. Carl Panzram has reached a final cut and post production has begun. $1,500 was raised for the Panzram online fundraiser. Contributions are still being accepted. Visit the PANZRAM FILM SITE to contribute. John Borowski will be appearing at a HH Holmes event in April. More info coming soon. The upcoming book, MAKING MOVIES ON YOUR OWN, will feature an interview with filmmaker John Borowski. INTERVIEW with John Borowski in The Chicago Examiner. 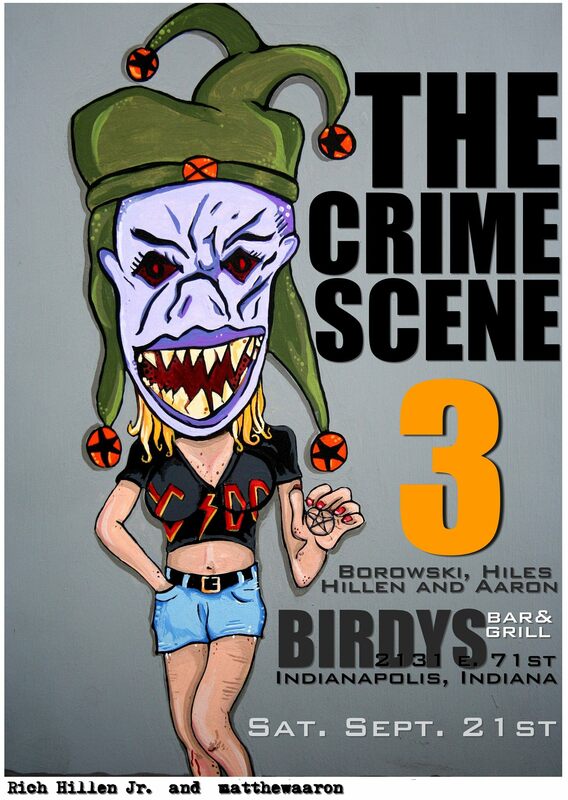 Set your calendar for THE CRIME SCENE event on May 28, 2011 in Indianapolis, Indiana. LISTEN to John Borowski interviewed on Jim Harold's Criime Scene. John Borowski to be interviewed for an upcoming book entitled: 21st Century Film: The Future of Indie Cinema. More info at author Leland Gaines SITE. John Borowski has completed editing the soon to be released music video, Mr. Fish, by the Swedish band Sparzanza. View HH Holmes on HULU. View HH Holmes and Albert Fish on Netflix and Amazon Streaming. HH Holmes and Albert Fish to be released on itunes soon. The new album by SPARZANZA released February 9 includes a song on Albert Fish which uses audio from Albert Fish: In Sin He Found Salvation. John Borowski is appearing as a panel guest at: Mashable Pre-SXSW Meetup in Downers Grove on February 17. Filming in January included Red Wing Correctional Facility and Minnesota State Historical Society for Carl Panzram: The Spirit of Hatred and Vengeance, to be relased in 2011. Matthew Aaron and Joe Hiles were interviewed at The Last Dime Museum in January for Borowski's documentary on Serial Killer Culture. John Borowski has been awarded the Indy Film Wisconsin Film Hero Award (non studio). Audio from Albert Fish wil be featured in a song by Sparzanza, to be released in February. Albert Fish reviewed at Hayes Hudson's House of Horrors. Panzram is finalizing production filming. the same City of Chicago jail where Public Enemies was filmed with Johnny Depp. John Borowski has begun production on a documentary titled: SERIAL KILLER CULTURE. The documentary will examine how serial killers have influenced modern culture. Matthew Aaron is the tattoo artist for Panzram. Scot Ryersson has completed several key props for Panzram. New Albert Fish Review at The Black Glove. Chilean filmmaker Patricio Valladares' film, Toro Loco is now in post production. Borowski is an associate producer on the film. at The Anime Central Convention in Rosemont. David Weiss cast as Henry Lesser. Tom Lodewyck cast as adult Panzram. John on Indy Film Wisconsin Blog Radio. Listen HERE. DVD signing at the Portage Theater, May 1. Stream to computer, PS3 or XBOX! Albert Fish screening in Greece. Fish will be screened as part of the Screamin' Athens Film Festival. Patricio Valladares' film, Toro Loco. For the release of John Everson's latest book, Siren, Borowski is teaming up again with Eric Richter to film three trailers which will be released in the three weeks leading to the release of the book. In 2007, the site In Cold Blog nominated Albert Fish for a Capote Award for Best True Crime Documentary Film. Now, John Borowski is writing a monthly article for In Cold Blog. The article will discuss Borowski's films as well as true crime films and books. Borowski finishing last doc in ‘Killer Trilogy’. Author John Everson discusses the Borowski-directed trailer which the interviewer states is "Definitely one of the better book trailers out there." Scot Ryerson has completed a key prop for Panzram. DVD autographing at The Anime Central Convention in Rosemont. Panzram rejected for submission on IMDB for the FIFTH time. Belmont-Cragin School 8th Grade Lecture. Netflix begins streaming HH Holmes and Albert Fish. Article on Borowski at ReelChicago.com - Borowski finishing last doc in 'Killer Trilogy'. Holmes and Fish screening at Horrorbles. Borowski will be autographing DVD's. No charge for admission! Come to Berwyn and check out the best horror memorabilia store in Chicago! Filmmaker Patricio Valladares' film, Toro Loco is co-produced by Borowski. Also check out the soon to be released (with a quote on the rear cover from Borowski) graphic novel El Italiano. Produced by John Borowski and Eric Richter, Cinematography by Eric Richter. Chicago Horror Film Festival - John Borowski appears as a guest. John Borowski DVD signing at the Summer Slaughter film festival. Hosted by the Horror Society. Love The One Your With Edited by Borowski for the AIDS Foundation of Chicago. Borowski also shot the animation sequence. DOWNLOAD ON DEMAND SERIAL KILLERS AT AMAZON! Rental and Purchase available. 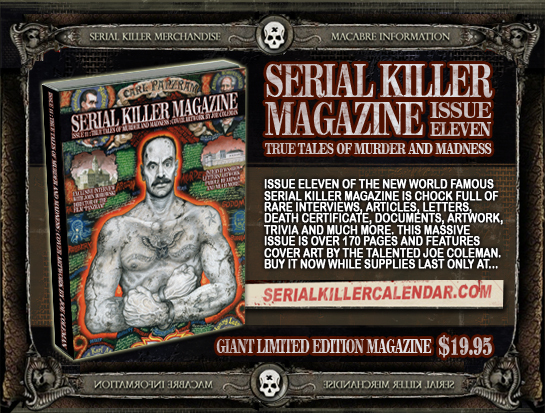 Synergy Magazine (Australia) Reviews Albert Fish and HH Holmes. Panzram filming in Kansas, Oklahoma and Missouri. Borowski meets with author James Jeffrey Paul to discuss his book: Nothing is Strange With You. Widside Cinema Interviews John Borowski. Amazon.com now stocks the book: The Strange Case of Dr. H.H. Holmes. ORDER IT NOW. Necroscopic Unlimited reviews Albert Fish. Killer Films names Albert Fish in it's top 10 serial killer films. John Borowski appears in The Biography Channel program: H.H. Holmes and the Murder Castle. June 13. Updates: Panzram began filming in February. John Borowski has been interviewed for an A&E Biography on H.H. Holmes. Waterfront Productions has published a book by Don Wynne titled The Pharaoh's Chickens. Waterfront will publish another book soon titled, The Panzram Papers. Albert Fish reviewed in Ultra Violent Magazine. It Came From Lake Michigan screen HH Holmes and Albert Fish. John Borowski signs DVD's. Panzram.com is live. John Borowski's third feature film focuses on the life of Carl Panzram. First Official Film Announcement of PANZRAM on johnborowski.com, October 19, 2007. MERCHANDISE STORE now open. More products and designs coming soon. Support 100% indie film by purchasing merchandise from CafePress! Shock Cinema Magazine Reviews Albert Fish: “this informative portrait of evil doesn't skimp on the grisly facts”. 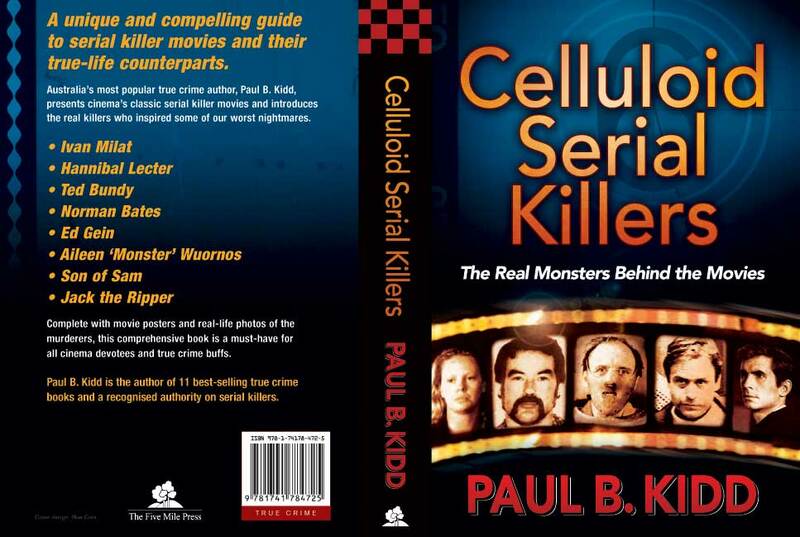 The Australian book, CELLULOID SERIAL KILLERS, features reviews of Albert Fish and H.H. Holmes. ISBN 9781741784725 - UPC 9781741784725 - Paul B. Kidd, Author - EMAIL Five Mile Press - Publishers - for more info. Borowski appears as a guest at Flashback Weekend Chicago Horror Convention. DVD signing and Albert Fish film screening. Rue Morgue Magazine reviews Albert Fish. Video Librarian reviews Albert Fish: “Recommended”. Dark Delicacies In-Store Albert Fish DVD signing with filmmaker John Borowski. - Burbank, CA. Albert Fish U.S. & Canada DVD release. Distributed by Facets Video. H.H. Holmes U.K. DVD distribution by Blackhorse Entertainment. Borowski begins writing two scripts: 1 Feature Narrative and 1 Feature Documentary. Bizarre Magazine calls Albert Fish “brilliantly absorbing”. Reviewed in their issue #119 titled (appropriately) SIN! Albert Fish DVD Collector's Edition Pre-Sales begin. Albert Fish screens at Bloodbath '06 horror & exploitation Film Festival, Bristol, U.K., The Cube cinema. H.H. Holmes has it's world broadcast premiere on Court TV and Book TV Canada. H.H. Holmes Screens at the Chicago Horror Film Festival. Bizarre Magazine interviews John Borowski on Albert Fish. Albert Fish World Premiere Screening at the Vine Theatre in Hollywood. John Borowski appears on Chicago Cable Ch. 25. 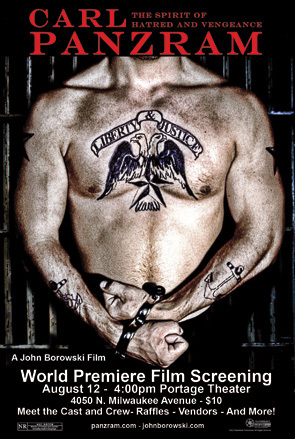 John Borowski on the COVER of Ultra Violent Magazine. H.H. Holmes is now represented by Bleiberg Entertainment for international distribution. H.H. Holmes mention in Natural Born Celebrities book. H.H. Holmes screening at Flashback Horror Convention in Chicago. Review of H.H. Holmes in the book: Creeping Flesh V. 2 published by Headpress U.K. Waterfront Productions relocates to West Hollywood, CA. H.H. Holmes acquired for distribution in the Benelux territory by Film Entertainment Group (FEG). U.S. and Canada DVD Release of H.H. Holmes: America's First Serial Killer - Oct. 26. H.H. Holmes is awarded BEST DOCUMENTARY from Screamfest L.A. and BEST SHOCKUMENTARY from Cine-Macabre in Gainsville, GA.
H.H. Holmes screened at Chicago Historical Society. Full house attendance of 400. H.H. Holmes secures U.S. distribution through Facets Video, Canadian distribution through Morningstar Entertainment. Filming Begins on Albert Fish. John Borowski's company, Waterfront Productions, distributes 1000 units of H.H. 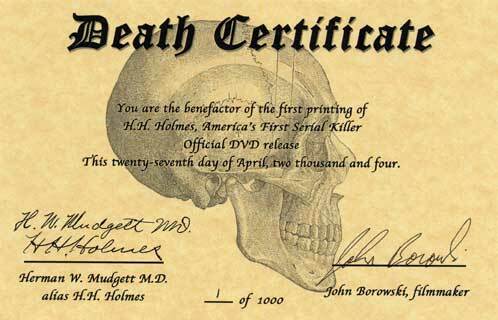 Holmes, America's First Serial Killer as a limited edition collector's DVD including a signed and numbered Death Certificate. 5.1 Surround track completed for H.H. Holmes by Aaron/Stokes. Darin Heinis is the surround mix engineer. Borowski awarded Best Director 2003 by Midwest Independent Film Festival. Editing on H.H. Holmes is finalized as The Devil in the White City book is released. Filming commences on H.H. Holmes: America's First Serial Killer. Research begins on H.H. Holmes: America's First Serial Killer.